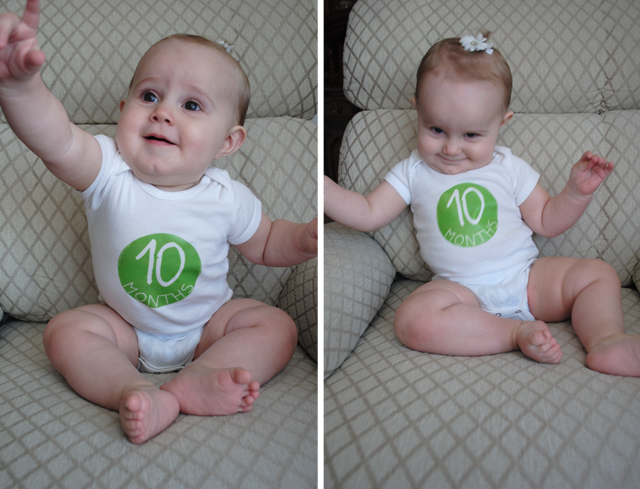 This girl turned 10 months old on March 14, which means 2 more months and she will be ONE... say what? But, let's not rush it. For now she is my favorite 10 month old and she never ceases to amaze me. -Learned to crawl "fast" when someone is trying to get her. -Loves walking everywhere with help from a person or furniture. -Decided that swimming lessons can be fun and will play with toys and smile. -Discovered the kitchen and has explored every cabinet in the house. -Loves to play with her toys and read books. She plays very well by herself. -Cut her two bottom teeth, which have both grown in half way. -Loves to help vacuum. She is fascinated by it! -Started sitting in a "big girl" car seat. While she should still be facing towards the back, we have her facing forward for now. -Learned to crawl up the stairs. She doesn't quite understand her limits with this yet, but we are working on it. -Started chatting all day long. She points at things, looks at someone, and chats away. -Loves waving at everything, especially in the car. -She still loves music, more than anything else. Her favorite songs are "Twinkle, Twinkle Little Star", "Popcorn Popping", "I am a Child of God", and "I Love to see the Temple". -Is no longer sleeping through the night. Daylight Savings really took it's toll. Usually wakes up twice, 11 pm and 6 am, and gets up around 8:30 am. -Took her first ride in a wagon and LOVED IT! She rode for about 2 hours and was happy the whole time. -Learning to copy more words and sounds every day. I wouldn't say she can say anything, but she is definitely figuring out how to talk. -Still loves to eat! She only has a couple bottles during the day between meals and snacks. Her favorite thing to do is sit at the table and eat by herself. She especially loves chicken, green beans, and bread. She doesn't like fruit that much, except for bananas and apples. -Started to snuggle more often. -Moved up to a size 4 diaper. -Still loves taking baths and cries every time she has to get out. It really blows me away how much she learns. I'm also surprised every day at how happy Sadee is. She always has a smile on her face and puts up with errand running and cleaning days. Also, notice in the picture above that she has a tiny ponytail in her hair... this is her first. She didn't like me putting it in, but baby ponytails are SO cute and her curly locks are beautiful! I'm excited to see what the next few months have in store for us. We love you Sadee! 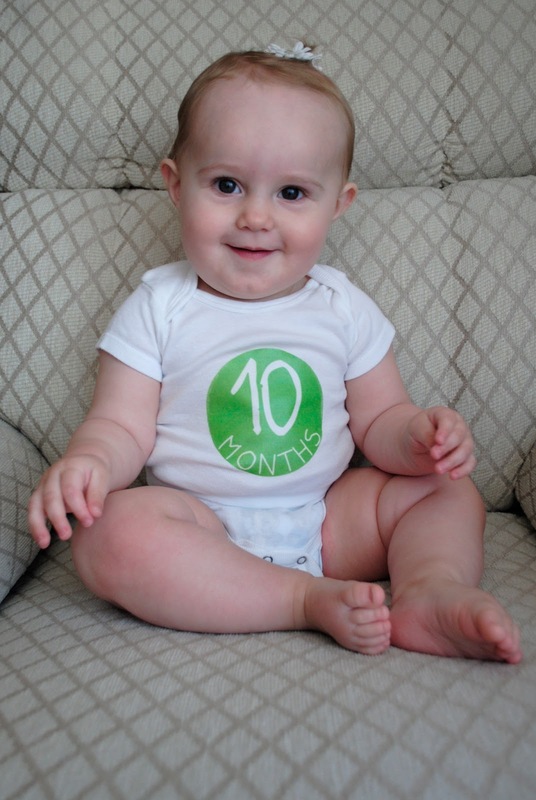 Happy 10 months and, like always, thank you for letting us be your parents! 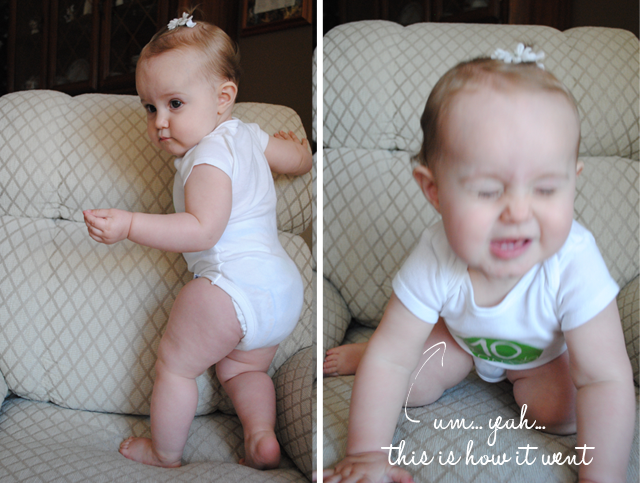 And for your viewing pleasure... this photo shoot did NOT go as planned. 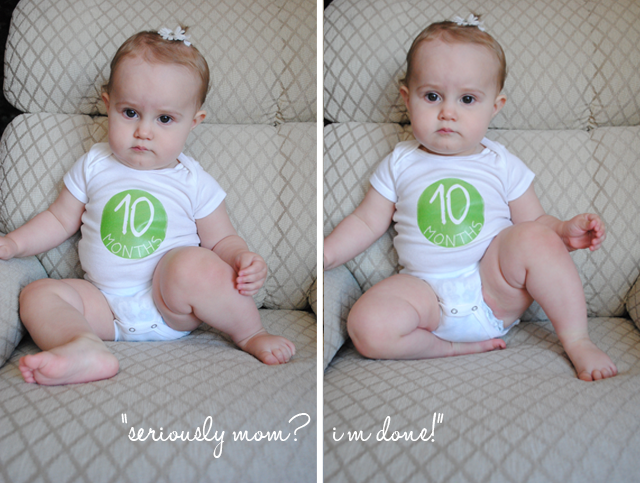 The only picture that equals happy baby + sitting still + all arms & legs in the picture is the one above. Don't believe me? See for yourself. I incredibly love her!!!! I want to squeeze her!! She is sooo cute. 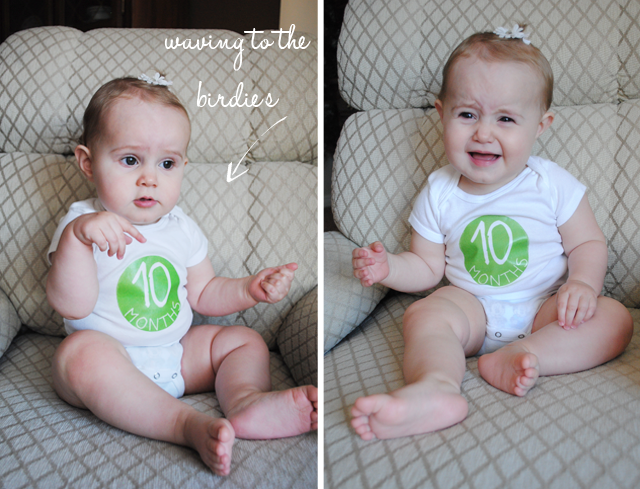 I can't believe she is ten months old! Crazy. Darling post.